March 15, 2017, 8:19 AM · The second movement of Mahler’s 4th symphony has a notorious concertmaster solo in it. It’s not a super-technical or virtuosic solo, but it’s a solo that requires some planning beyond just practicing it. The solo requires two instruments: one violin tuned normally, and the other tuned up a whole step higher (instead of G-D-A-E, it's A-E-B-F#), which creates a tense, bright, and almost vociferous tonality. According to Mahler’s wife Alma, he was inspired by the painter Arnold Böcklin’s self-portrait. 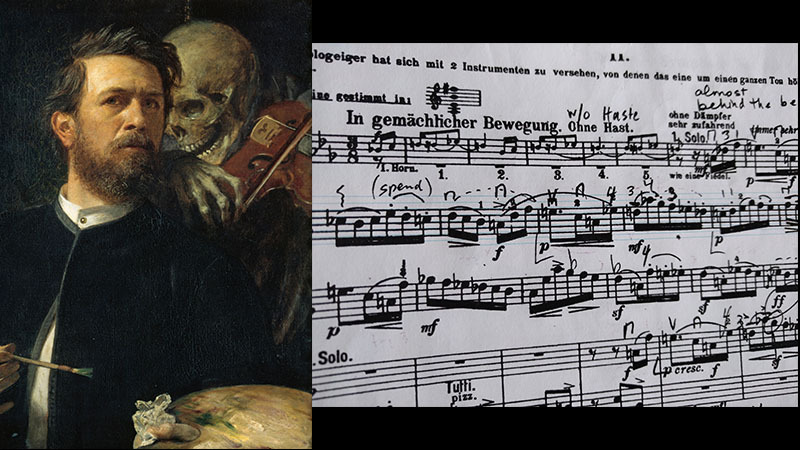 The self-portrait is unique because as the artist captures himself, The Grim Reaper or Death, in skeleton form, plays violin into the artist’s ear. It’s an evocative work and one can gather how Mahler might have felt when he first saw the portrait. Acquire additional violin. Even though Mahler suggests “fiddle-like” in the score, I find the solo requires a more complex sound so I usually use my 1922 Fritz Pulpaneck violin which has amazing color changes and can handle the abrupt mood swings of Death: edgy, elegant, seductive, and taunting. If I didn’t have the Pulpaneck, I would most certainly look for a violin that had qualities listed above. Budget for strings. The whole step raise in pitch for the additional violin puts an enormous amount of pressure on that violin. Some people like to experiment with various string gauges, but I’ve found success in breaking a new set of strings in on my primary instrument and then transferring after a week or so to the additional violin. Also, allow for several E strings to break as tuning an E to an F# is flirting with disaster if there is no backup string. Total cost of two sets plus 3 extra E’s for me comes to about $210. I use Evah Pirazzi Gold for reference. Plan for shoulder rests. Since the violins will be switched several times during the 2nd movement, having a shoulder rest that won’t fall off is a must. Nothing breaks the musical moment worse than a clatter of an old shoulder rest falling to the stage floor. I use a Kun Voce on my Cavani and a KorfkerRest on the Pulpaneck. They each fit tightly and sound fantastic on both instruments. Practice the scordatura solo. For people with perfect pitch this solo can be tricky. What you see written on the solo part isn’t what’s coming out under your ear. So, getting use to the tonality, paying close attention to whole and half steps, and really playing with (almost over exaggerating) leading tones will make the intonation slightly easier, but also it lends nicely to the character. Practice the entire 2nd movement. It’s one thing to just play the additional violin with its different tuning, but it’s another to practice switching instruments. I like to set up a simulation of what the performance will feel like. I keep one violin in a case to the left of my chair, or wherever I think it’ll be on stage, and then I play the movement straight through, practicing switching the violins, getting used to the different weight, sound, feel, and intonation. Besides my checklist, there are a few things that I never forget. With each performance, there is a different interpretation. People can debate about the intention of Mahler, the proper sound of a fiddle, what kind of tone is appropriate, etc. But in my opinion, playing the solo with sincerity and purpose with the utmost preparation will give the chilling effect needed to create the best experience. After all, it’s about transporting an audience! March 15, 2017 at 04:57 PM · I'll probably never play that, but it's great that you've documented your experience and insight with such clarity for those who might. March 15, 2017 at 06:21 PM · Very interesting, many thanks for the inside perspective!